Gilman Overpass: What To Seek? A year ago, AS&R sent a letter regarding active transportation elements of the proposed Gilman interchange project. It was joined by the Berkeley Climate Action Coalition’s Transportation Working Group, Bike East Bay, the Albany Berkeley Soccer Club, Berkeley Rhino Rugby Club, Berkeley Rugby Football Club, and Berkeley Lacrosse Club. Until two weeks ago, Alameda CTC, the lead agency for the project to whom the letter was sent, had not responded. Fortunately, during the year of silence Alameda CTC did direct the project engineer to analyze alternate alignments for the proposed overpass. At the time of the letter, only a southern “U” overpass alignment was being pursued, as shown on the map below. The best alignment in terms of maximizing the number of people that would ride or walk to the waterfront connects the west end of the Codornices Creek Trail to the Bay Trail at Gilman. This is because studies show connecting a new path to an existing path results in more people riding the new path than connecting a new path to a cycling facility on a street. Also, the majority of the population that would use the overpass lives north of Gilman where the population density is higher and more Albany Berkeley Soccer Club players live. For instance, there are a thousand families with children in University Village a short distance north of the project compared to few residents similarly close south of the project. The map also shows roads people cycling or using sidewalks would have to cross color coded by hazard, along with the average number of motorists traveling along the routes each day. 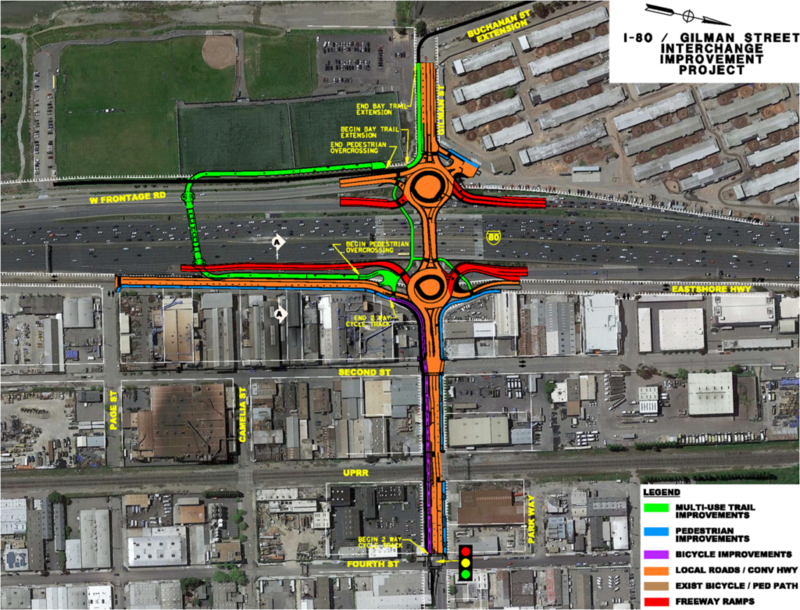 The orange intersections along Gilman are signalized, or in the case of Fourth Street proposed to be signalized as part of the Gilman interchange project. The red intersections along Gilman are not signalized. Consequently motorists can turn right and left from Gilman onto those streets across the path people would have to take to an overpass at either the southern or northern “U” alignments. In particular, the intersection at Second Street cannot be signalized because doing so would cause motorist backups into the eastern roundabout, which could cause grid lock. At the same time, the roundabout design also requires that motorists headed north or south on Eastshore Highway from Gilman do so via Second Street. Consequently there would be many motorists turning from Gilman onto Second. In contrast, the desired connection to the Codornices Creek Trail requires users to only cross two streets with fewer motorists midblock, which is much safer. However because this desired connection involves two overpasses as well as alignment along the creek in part, the groups sending the letter decided garnering this alignment in one go was likely too much of an ask. 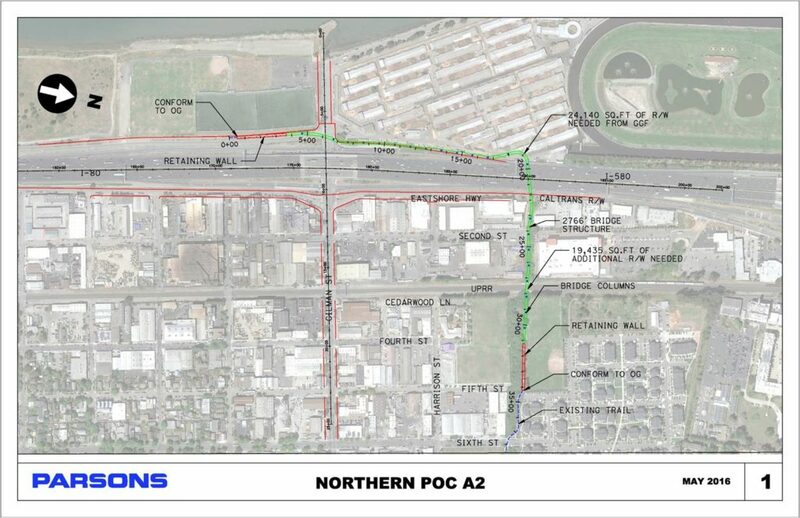 Consequently the groups asked Alameda CTC to consider a northern “U” alignment that would allow for connection to a railroad overpass to the Codornices Creek trail in the future. Last week Alameda CTC shared the three alignments it has studied. The southern “U” primary alignment is shown first below (in green going across the freeway in the left side of the map). 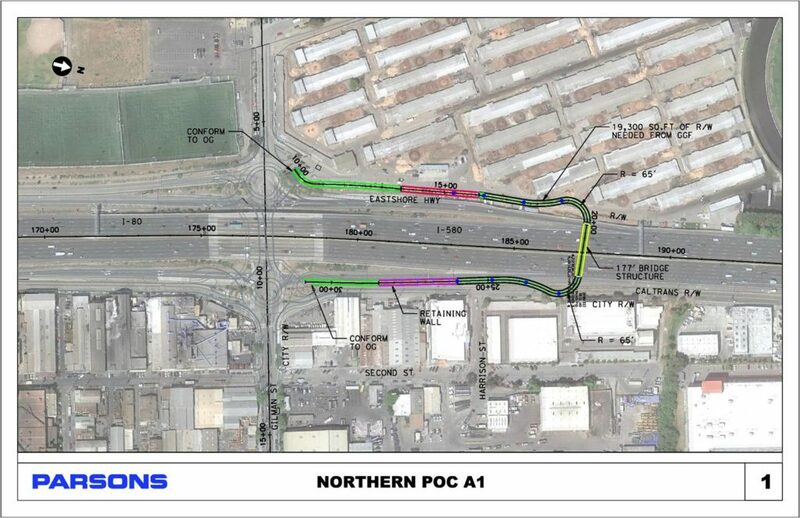 As compared to the previously available design iteration, a two-way cycle track on the south side of Gilman is proposed connecting to the overpass (shown in purple). However, as mentioned, users of this facility would have to cross through motorists on Gilman turning into Second Street without any signal protection. Next is the northern “U” alignment requested in the letter. 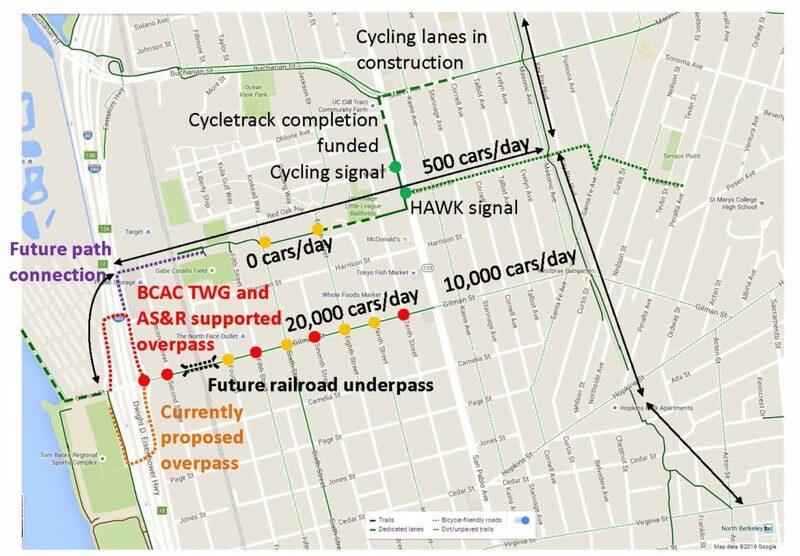 While not shown, conversation with Berkeley Transportation Division staff suggests a two-way cycle track on the north side of Gilman connecting to the northern “U” alignment is likely as feasible as one on the south side connecting to the southern “U” alignment. Finally, and with surprise, Alameda CTC studied a northern “L” alignment directly connecting the west end of Codornices Creek trail (where there are sports fields) and the Bay Trail south of Gilman (where there are also sports fields). It found all of these alignments feasible in terms of engineering. However they differ in cost and how soon they could be implemented. 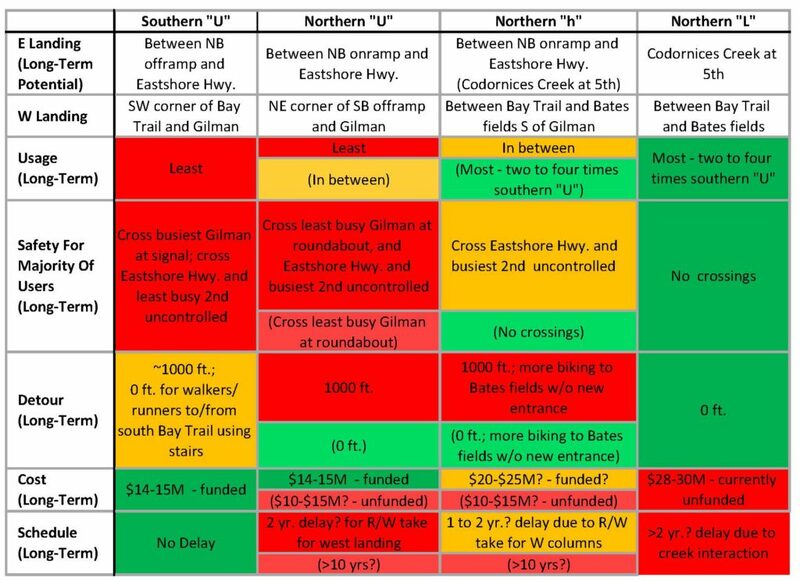 This is due to differences in available funding as well as the need to acquire right of way for the northern alignments, and engineer and permit the portion of the path along Codornices Creek. The meeting with Alameda CTC last week brought forward a hybrid option, the northern “h” alignment (the lower case “h” reflects the term “hybrid” as well as the longer western leg in the near term and future northern connection on the east side in the long term). This combines the eastern leg and freeway overpass of the northern “U” with the western leg of the northern “L.” The advantage of this is that it precludes users from the north, which are the majority, from having to cross through motorist traffic on Gilman at all. Each of these options has pros and cons, as shown on the table below. Alameda CTC is hoping that all the stakeholders can agree on pursuing one alignment at this time in order to simplify its effort going forward, which translates to time and cost saved. The alignments are ordered from least usable but most achievable in the short term, to most usable but least achievable in the short term. The northern “U” and northern “h” have the option of being extended to Codornices Creek in the long term. This could occur in particular as a mitigation if the railroad underpass on Gilman specified in the County Transportation Expenditure Plan moves forward. Which alignment do you think AS&R and the other groups should pursue? Leave a comment below or send a message to the AS&R discussion list (albany@lists.ebbc.org) or BCAC TWG google group (bcac-transportation-wg@googlegroups.com) if you are a member. Alameda CTC is hoping to make this decision early the week of October 16th, so your response before then will have the most impact. 2 comments to Gilman Overpass: Which Alignment? Finally a map that makes the whole thing clear. Obviously the AS&R supported northern track is the best option because it fits into the other cycle and walkmpaths already in place or planned. Please, northern L. Others look scary, nasty, need to bike through Blade runner katy to get to the bridge, which is super long in itself. Huge wastes of concrete. Thanks.